The Turkish military says it launched a new round of airstrikes on Islamic State group (IS) militants and rebel Kurdish bases in northern Iraq on Tuesday. Two F-16 jets also hit positions belonging to the banned Kurdistan Workers' Party (PKK) in southeast Turkey, hours after NATO voiced unequivocal support for Ankara's response to what it called "terrorism" within its own borders. There were no reports of fresh strikes on Islamic State positions in Syria, which began in parallel with Turkish attacks on the PKK Friday. NATO Secretary General Jens Stoltenberg, left, talks during a North Atlantic Council Meeting at NATO headquarters in Brussels on Tuesday July 28, 2015. 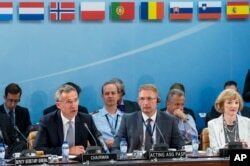 A statement released by NATO Secretary General Jens Stoltenberg after Tuesday's emergency session of the military alliance's 28 ambassadors in Brussels said: "NATO is watching developments very closely and we stand in strong solidarity with Turkey." Before the meeting, which was called at Ankara's request to discuss the conflict in Syria and Iraq — and to seek NATO's political backing for the strikes — Stoltenberg had called for proportionality in the attacks against the Kurdish rebels. The PKK, which has battled Turkey for greater minority rights for three decades and is designated a terrorist organization by numerous NATO member states, has aggressively battled IS militants with substantial success in both Iraq and Syria. With NATO now giving strong public support to Ankara, analysts say it will likely embolden the Turkish campaign against the PKK in particular. "No steps back will be taken in our fight against terrorism," Erdogan said at a Tuesday news conference, just a day after calling the three-year peace process with the Kurdish rebels defunct. "This ... will continue with the same determination." On Monday, Turkish Prime Minster Ahmet Davutoglu vowed the attacks against the PKK, which is being blamed for Monday's retaliatory killing of a Turkish officer in the predominantly Kurdish southeast, would continue until it disarms. According to reports on the closed door meeting by the Associated Press, NATO members urged Turkey to continue peace efforts with representatives of the Kurdish minority. But observers say the NATO meeting has ended hope of a de-escalation in the conflict between the PKK and Turkish security forces. "In a situation like this, Turkey, rather than bow down, first escalates, then when things get out of hand for it, it starts bowing down," Semih Idiz, political columnist for Turkey’s Cumhuriyet newspaper, said. "So it depends on the nature of the pressure. That is why I think especially Washington is treading very cautiously." The United States said Monday it is working with Turkey on an attack plan to clear Islamic State insurgents from northern Syria, a campaign that would escalate Ankara's involvement in the fight against militants in the region. A U.S. official told news agencies the goal is to create an "Islamic State-free zone" to "ensure greater security along Turkey's border with Syria." But the official said the joint U.S.-Turkey military operation would not include the imposition of a no-fly zone in the region, a long-standing Turkish demand. The U.S. fears creation of a no-fly zone to halt Syrian government air raids in the region would draw American forces deeper into the four-year fight that several groups are waging to overthrow Syrian President Bashar al-Assad. After months of reluctance, Turkey last week launched attacks on militant targets across its border into Syria after a suicide attack in Turkey killed 32 people and a car bomb killed two Turkish soldiers. Ankara also agreed for the first time to let NATO use the Incirlik air base for airstrikes on the extremists, sharply cutting the distance for U.S. fighter jets that had been traveling from Iraqi air fields for attacks on Islamic State targets in northern Syria. But Turkey's aerial attack to push Islamic State fighters out of its long boundary with Syria is likely to complicate fighting. Syrian Kurds are among the most effective forces battling extremists in Syria and Iraq, but Ankara fears they could boost a Kurdish insurgency inside Turkey. The U.S. is backing Turkey's two-pronged air offensive and artillery strikes against Islamic State militants in Syria and Kurdish rebel targets in Iraq. Tuesday's emergency NATO session is only the fifth of its kind since the alliance's founding in 1949. Any NATO member country, such as Turkey, may ask for consultations when they believe their territorial integrity, political independence or security is threatened. Some information is from AP and AFP.